Business Intelligence (BI) unites technology, infrastructure, and activities to organize and analyze data for improved business performance. By utilizing BI, you can look at your business’ data through a larger lens and discover significant trends that can improve businesses operations. How can you utilize Business Intelligence to accelerate your business? BI can integrate data from multiple platforms into a single, centralized view and pull from both external and internal sources. This compilation of information can lead to a better understanding of how your company’s data interacts as a whole, and allow for an in-depth examination of business trends. Instead of just receiving facts and figures with reporting, utilizing BI means you’re able to learn why certain trends are happening in your data. You can investigate business processes to determine what is working for your business or where you can cut costs. This information is integral in strategizing your business plans and can be a strong factor in any decision-making process. BI programs, such as Power BI, allow you to view your data how you want to see it and present it in an organized, comprehensive manner. You can look at data sets from every angle and drilldown on specific categories; whereas with standard reporting, your data stays in a static format and does not allow for different perspectives. BI tools also allow you to display your metrics and key performance indicators in easy-to-understand dashboards, performance scorecards, and infographics. By using BI to analyze your data, your business can investigate past data trends that have impacted operations, and observe potential opportunities and threats for the future. BI gives you the power to predict how data will trend, and allows you to look at data long-term rather than seeing only a specific point in time. BI grants you the ability to look at your data in real time instead of only on a periodic basis. If your business recently implemented a new process, you can use BI to analyze and determine the effects of that change at any point in time, leading to accelerated and improved decision-making. BI provides powerful tools that allow your business to analyze data in-depth and can lead your company to success. Want to know more on how BI can enhance your business? 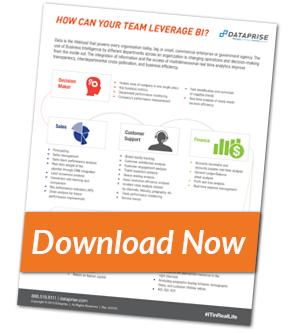 Download our infographic “How Can Your Team Leverage BI?” to see how different departments can apply BI to improve business efficiency. Want to know more about BI? Contact us today for more information on what business intelligence can do for your business.